Motorola has just announced some huge deals on Moto Z2 Play, one of the most underrated phones that is an all-rounder in every aspect. The phone’s got great hardware, decent design and now comes with a cool $150 discount for Valentine’s day making it a great purchase. While most smartphone manufacturers are going towards bezel less design and improved hardware, Motorola has built their customer base by offering no-hassle smartphones in the past few years. You can comfortably buy any one of their models and it will work seamlessly without any issues or try to usher in some nifty feature that doesn’t work in the end. Everything about the Moto Z2 Play is great and the phone is now even cheaper. The best part about this range is that buyers can get access to a wide range of mods. As promised earlier, the manufacturer ensured lots of mods were made available in the market. The original pricing of the phone was $500 which is now getting a cool discount of $150 on Valentine’s Day. If you are planning to purchase the phone for $350, it is pretty much a sealed deal and there is no need to have any second thoughts. Motorola is further pushing the boundaries by offering some great discounts on a huge lineup of mods that would work with your new Moto Z2 Play phone. All popular mods are getting a cool 25% discount making it cheaper to buy more than just one and gift it to your loved ones. The mods that you could buy include Polaroid Insta Share Printer, Gorilla Glass 5 style shells, Amazon Alexa Moto Mod and many more. As part of the deal, the company is also offering Moto Z2 Force which comes with the free Alexa mod which is work $150 on its own but the pricing of the Force might remain the same. In terms of specifications, the Moto Z2 Play has a moderately large 5.5-inch display with resolution of 1920 x 1080 pixels and is powered by a Qualcomm Snapdragon 626 processor. The mid-range processor is capable of handling all day to day tasks with ease while it is adequately powered with 3GB or 4GB of RAM variants. The phone offers 32GB or 64GB of storage space based on the variant you choose. There is always the option to expand it using the micro SD card slot. 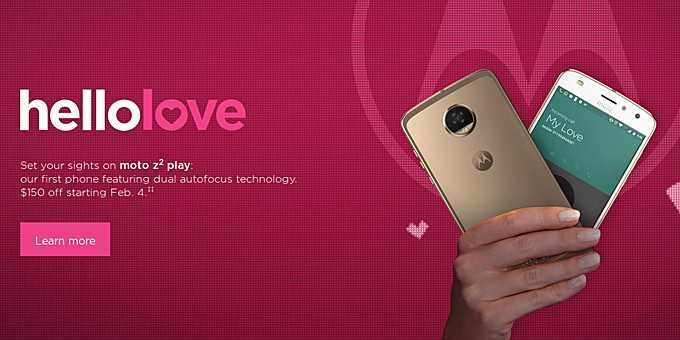 The valentine’s day offer on Moto Z2 Play will be for a limited time but it still got a good two weeks to go before it ends.